This flight was to be a Double Mission to pick up 2 campers headed for Victory Junction in NC. We would be picking up our first Passenger (Daniel) at BWI (Baltimore MD) and then we would pick up our second passenger at Newport News VA, but due to issues beyond our control (wrong numbers for communication) our stop in Newport News was canceled the day before our flight. So on Sunday morning (July 9th) we departed home base and headed for Baltimore MD. Our flight conditions to Baltimore were clear and very smooth with a nice little tailwind. As we neared Baltimore we were vectored in for our landing on 33R (This almost always gives us a nice view of Baltimore’s Inner Harbor area). At Greensboro they were using runway 5R but we asked if runway 32 would be available (although 32 would have a crosswind, it would shorten our approach time getting in)….. so we were cleared by approach control for a visual to 32 and then the tower cleared us to land. We were about an hour ahead of the scheduled time of Victory Junctions Camp bus arrival time, but once we got in the FBO we found that they were was ahead of schedule as well and already there ! This worked out great (we always wait to make sure our passengers get there ride to were ever they are going before we leave the airport) so this allowed us to be ahead of schedule getting back to home base. 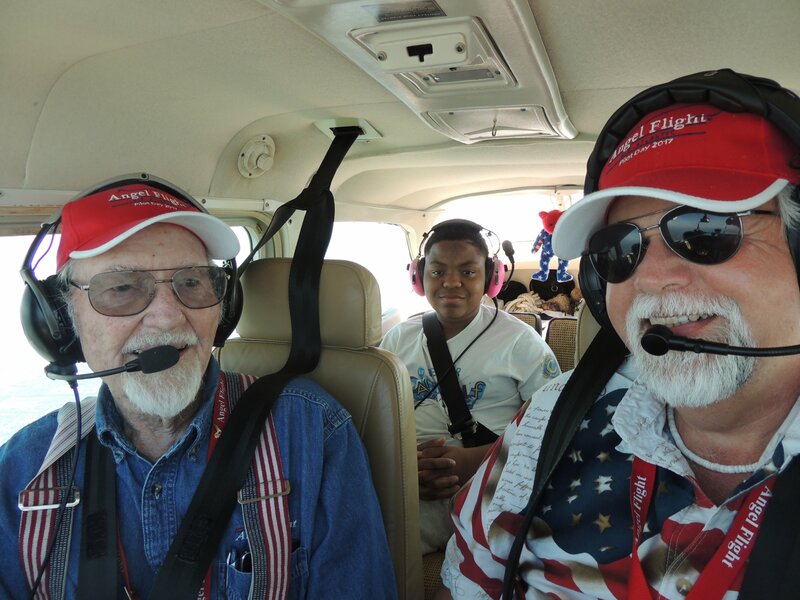 After giving our goodbyes to Daniel and talking with the Camp Bus Drivers and some other Angel Flight Pilots, we loaded up and departed Greensboro for our flight back home. After tucking 49Bravo back into her hanger we each enjoyed a nice hot cup of hanger coffee and discussed the events of the day……. then, as always, we departed the airport on one of the most dangerous parts of the day….. THE RIDE HOME ! Following are some photos of our flight…..
Feel free to leave comments …… we love them !